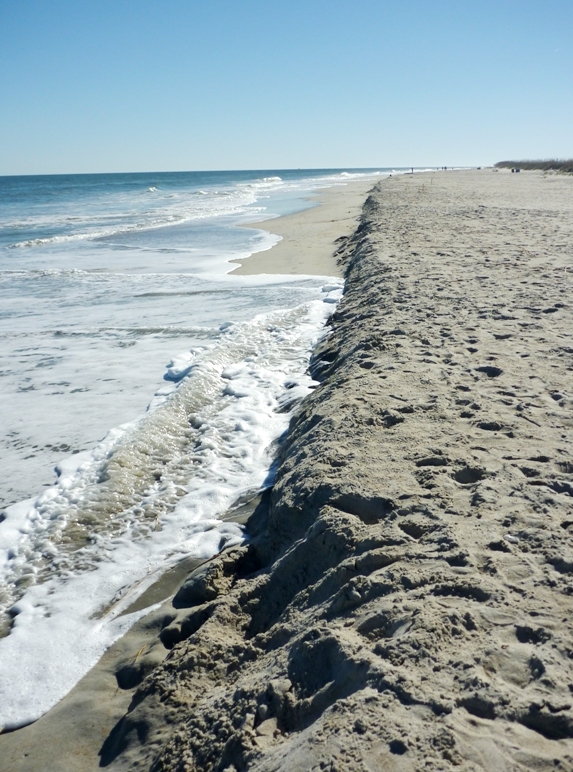 Severe beach erosion can be a significant problem for coastal communities affected by hurricanes and tropical storms like Hurricane Sandy. 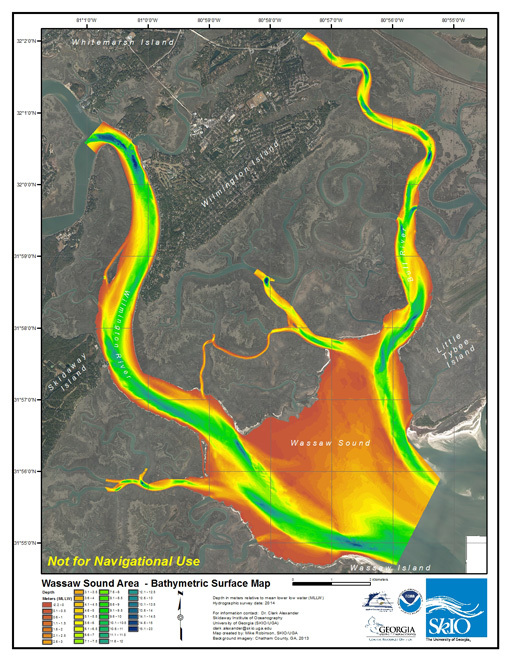 To assist Georgia communities in future recovery efforts, the University of Georgia Skidaway Institute of Oceanography entered into a cooperative agreement with the Bureau of Ocean Energy Management to evaluate existing data on Georgia’s offshore sand resources and identify where more data are needed. This consolidated information will increase knowledge of Georgia’s offshore sand resources and contribute to long-term coastal resilience planning. 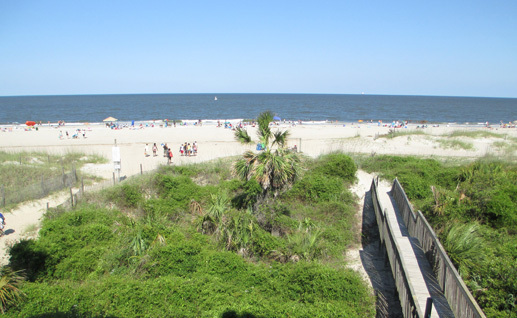 Beach communities like Tybee Island can be affected by hurricanes and tropical storms. 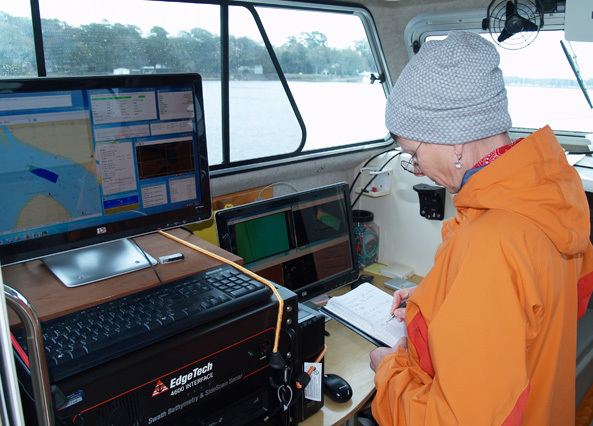 Under the $200,000 agreement, UGA Skidaway Institute will gather, evaluate and analyze existing geological, geophysical and benthic habitat data off Georgia’s coast and identify gaps in the information. 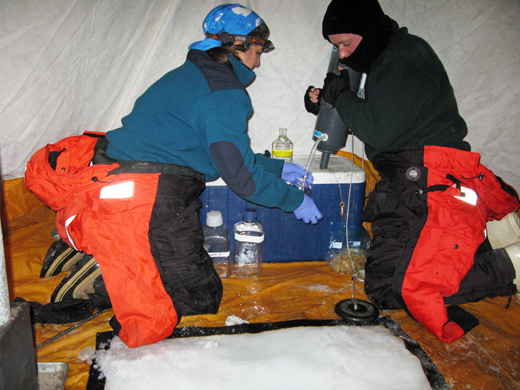 Based on the data gaps, project scientists will suggest areas for future geologic studies to confirm previously identified sand resources and locate new ones. “A reliable inventory of offshore sand resources will help the Department of Natural Resources be effective at representing the state’s interest in discussions with BOEM and other federal agencies. 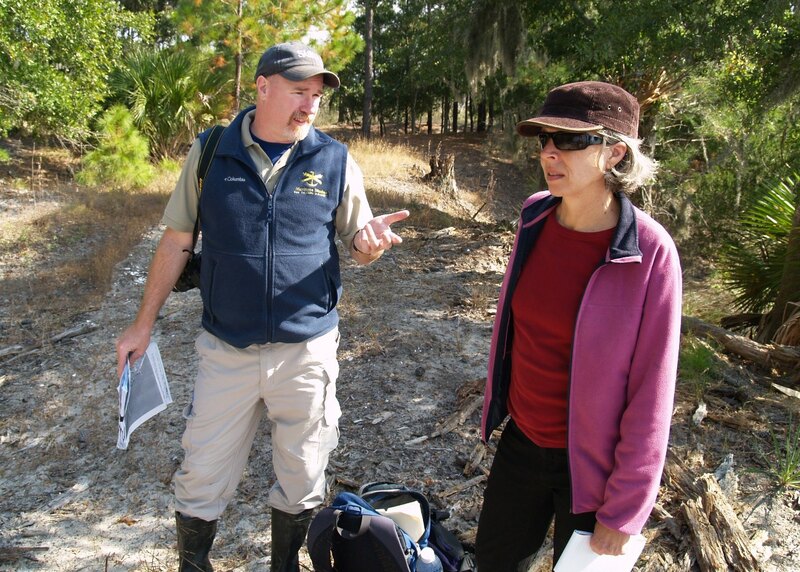 We appreciate the initiative of Dr. Alexander and the UGA Skidaway Institute and look forward to the results of this project,” explained Spud Woodward, director of the Georgia DNR Coastal Resources Division. The current project will be limited in scope – primarily evaluating and consolidating existing data regarding Georgia’s offshore resources. Much of the older information is only available in printed form, and needs to be converted to a digital format to be useful in the software that managers and scientists use for viewing and analyzing data. The goal of the project is to have all the compiled information readily accessible to coastal managers and municipal planners. This agreement is one in a series of partnerships with 14 coastal Atlantic states, using part of the $13.6 million allocated to BOEM through the Disaster Relief Appropriations Act of 2013. The combined agreements support research that will help to identify sand and gravel resources appropriate for coastal protection and restoration along the entire Atlantic Outer Continental Shelf. Along the Savannah River in Chatham County are the remains of a large, complex, former rice plantation. Archaeologists may be able to learn much about the life of Georgia’s early inhabitants by studying this site, but only if they hurry. 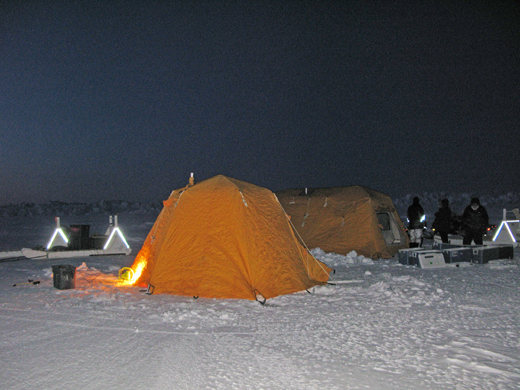 Site 9CH685, as it is known, is threatened by shoreline and tidal creek erosion – the result of the nearby river moving closer to the site every day. Site 9CH685 is just one of 42 archaeological sites on Georgia’s back barrier islands recently studied by a team from the Skidaway Institute of Oceanography and the Georgia Department of Natural Resources (DNR) Historic Preservation Division. The sites include a range of types, from Native American shell middens to colonial cemeteries and Civil War artillery batteries. 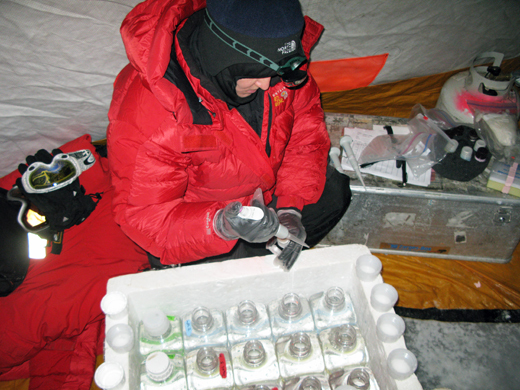 The team spent two years studying the erosion and accretion patterns near each site to assist DNR in prioritizing the sites that require the most immediate attention. 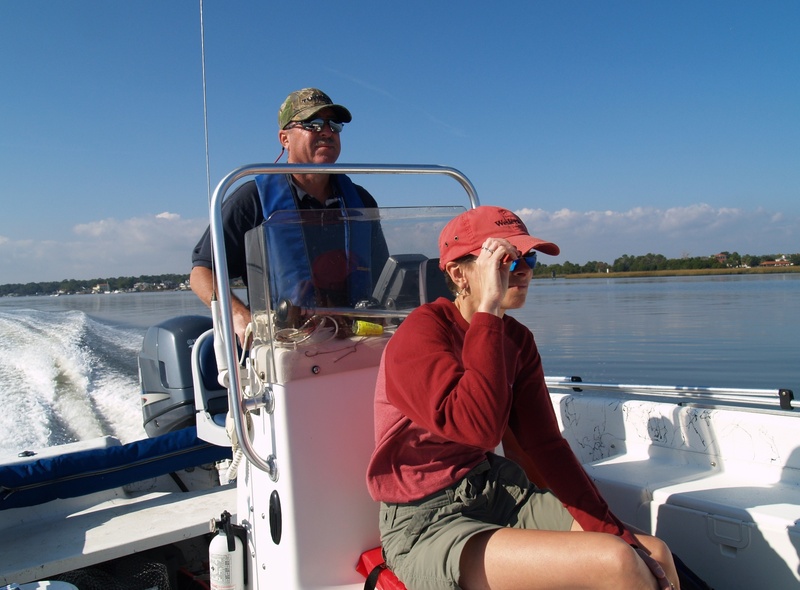 Funding for the project came from the Georgia Coastal Zone Management Program. Typically it is not feasible to preserve sites against these forces, so it is critical to document the sites before they are lost if there is any hope to record the history contained within them. The team used a combination of current shoreline measurements near the known sites, combined with historical shoreline information from aerial photographs, charts and maps, some dating back to the mid-19th century. 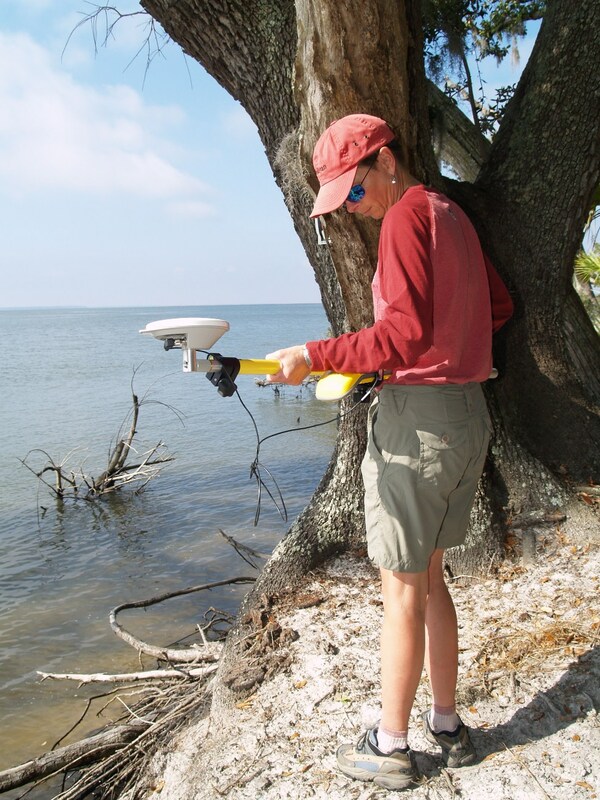 Skidaway Institute's Claudia Venhern uses a highly accurate GPS instrument to record the shoreline of a Georgia coastal island. 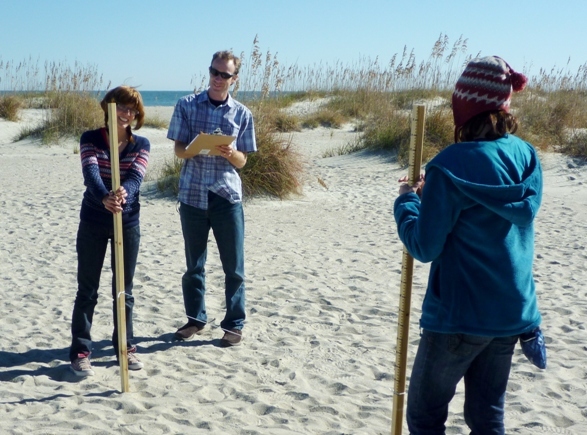 It was Skidaway Institute researcher Claudia Venherm’s job to survey the current shoreline. Using an extremely precise GPS receiver, she walked the shorelines measuring the exact location of the high water mark within a few inches. Later, she mapped the shoreline and compared it with the historic data for the same location to determine how fast the shoreline is changing. “We can use Geographic Information System (GIS) technology to overlay the location of the current shoreline with the shorelines from older photos and maps and obtain a very good picture of what is happening to any piece of coast,” Venherm said. 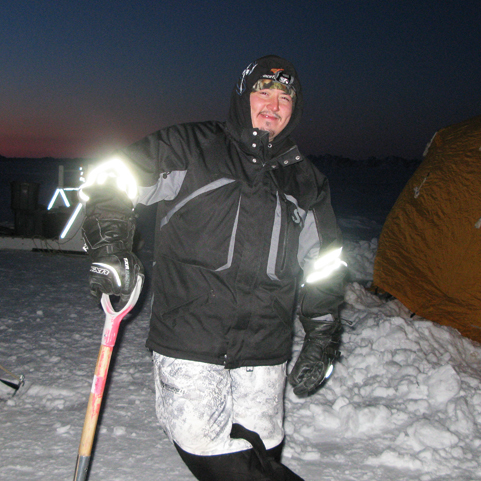 All the sites were examined to determine which were in the most danger of loss to erosion. The projected life of each site was calculated as the number of years until erosion would destroy the entire site. 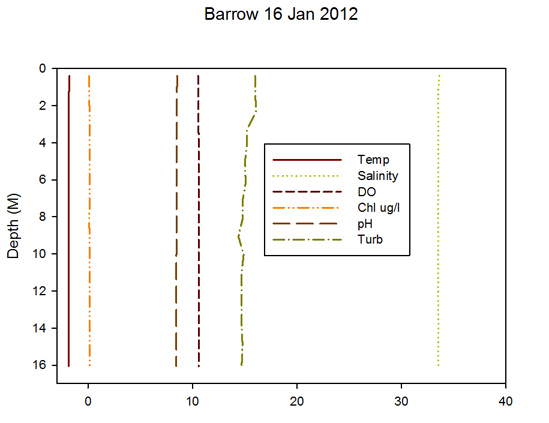 Six sites had already been lost to erosion by the time the team visited the coordinates for these sites. Four more sites were still present, but are completely or almost completely submerged at all stages of the tide. The team determined 21 of the sites were eroding, and three of those have a projected life of less than 50 years. That rice plantation site has already yielded clues about the early Georgia economy. The tidal creek threatening the main site has produced several surface artifacts from the late 19th and early 20th centuries. A section of whiteware dinner plate etched with the name “Greenwood China Company”, which designed dinnerware specifically for use aboard coastal steamboats, was found in the creek bed. This merchant firm distributed spices and coffee at the end of the 19th century, and its discovery at a Savannah River site hints at important turn-of-the-century maritime sail and steam trading networks. These glimpses into the past are fleeting however, as time and tide erase these ephemeral fragments of history. This study provides the data that the DNR needs to save as much of Georgia’s rich coastal history as possible. and stomping around looking for archaeological sites that may be threatened by erosion. Claudia Venherm using a precise GPS to map the shoreline. It is a joint project with Chris McCabe, the Georgia DNR archaeologist who is stationed on our campus. Mary Landers from the Savannah Morning News came along and wrote a very nice story on the excursion, which can be seen here.